В отличие от предыдущих продуктов данной линейки, Microsoft Surface Go очень доступный. Однако, как мы знаем, все имеет закономерные последствия и в данном случае это низкая производительность. Давайте посмотрим, как планшет от Microsoft покажет себя в сравнении с конкурентами. Given the right dock, it could be a work, home and travel device. It would be equally good for students and workers. My wife uses the original Surface as a Kindle reader, video consumption and occasional work device and it only has 2GB! When it comes to mobility, the Surface Go stands far ahead of the competition. Small enough to fit into your coat pocket, yet with enough juice to last through a whole working day, there is a fair bit to recommend it for. If you require more power, then step up to the Surface Pro notebook, which doesn't cost a lot more, but it won't be as portable and convenient as the Surface Go - and that is its true ace. The Surface Go will not satisfy everyone, but it is a capable sidekick when you know what you're getting in to, and you appreciate its extreme portability that doesn't quite have an immediate equal - at least not from a major player. My basis for comparison would be my Ipad Pro on which I consume a lot of content, and which is really the gold standard for tablets. Even with my older version of the Ipad, the colours feel a little bit brighter and my grip a little more comfortable with less sharp edges. Despite the performance and battery life, Surface Go looks to be a bit of a hit, with a usage share already higher than many Surface devices that have been on the market longer. Clearly the small size and good build quality is something people are looking for. Adding LTE to that increases the mobility further, and although Microsoft likely won’t sell more LTE models than WI-FI, it definitely increases the potential market. And, despite the Surface Go being priced at a premium for a small form factor convertible tablet, it is still priced well under the entry level Surface Pro 6. The Pro 6 offers much higher performance, a bigger, nicer display, better battery life, and a keyboard that doesn’t feel cramped. But the Surface Go is smaller, lighter, and less expensive. With already 12% of the Surface usage share, that appears to be a winning formula. 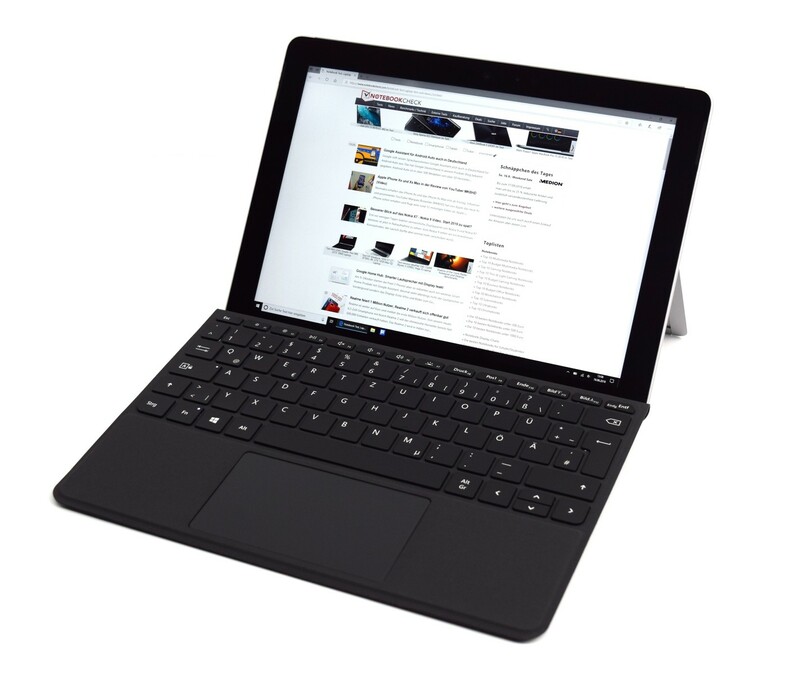 For now look at the Surface Go as an affordable on-the-go computing device for those who like to read and write. It could also be the device you buy for a high school or college student. Also, it is recommended that you pick up the 8GB/128GB version, even though it is a tad more expensive. There is no shortage of small-form Linux computers out there, from Planet Computing’s Gemini PDA to the GPD Pocket “palm top” to the quirky stylus-enabled One Mix Yoga. But when it comes to an eye and finger-friendly general purpose Linux tablet that you can do almost anything on, within reason and limitations, the Surface Go seems to have, rather ironically, come closest to being the Linux iPad Pro. Now that is a real computer. The Microsoft Surface Go is not exactly meant to replace you ..
zAt the end of the day though, I can't figure out why I'd recommend the Surface Go instead of an iPad. Apple's cheapest iPad costs $70 less than a Surface Go, it's faster, it's a more seamless tablet experience, and it supports the Apple Pencil, which costs the same as a Surface Pen. One might argue that an iPad can't run the "full" apps that Windows can, but I don't think the Surface Go can run those apps with its Pentium Gold processor, if we're talking about the power-hungry apps that aren't available on a mobile OS. 80% Microsoft Surface Go review: a new iPad Pro and Galaxy Tab S4 killer? The Microsoft Surface Go is a pro-level tablet computer that successfully breaks into the market traditionally dominated by the Apple iPad Pro and Samsung Galaxy Tab ranges. It doesn't quite match the slickness of its rivals, but then again its rivals don't have the flexibility of Windows. The Microsoft Surface Go is a great tablet/laptop and does what it is designed to do extremely well. The Surface Go is compact, light and easy to carry around with you every day. Throw it in your bag and you have a tablet with the functionality of a desktop PC on the go (hence the name). Even if it’s not too powerful and lacks legacy ports, the Surface Go is portable enough to draw attention and cheap enough to open wallets. Although a poor man’s Surface Pro on paper, in practice this petite 2-in-1 is highly versatile, intensely portable and thoroughly charming. If it wasn’t for a handful of flaws like its disappointing battery life, it’d almost be a better option than its more powerful cousin. It’s a 2-in-1 that doesn’t make us wish we had a traditional laptop instead, and for that it should be commended. Creatives and media junkies won’t like the small screen but as the cheapest Surface going this is by no means a compromised product. The Surface Go is a super portable 2-in-1 that's great as a second go-anywhere machine. Unfortunately, battery life isn't great and once you've added the accessories it's not cheap. But for a portable machine there's little else to take it on. The Surface Go is a quiet triumph for Microsoft. The company has successfully distilled what is best about the Surface Pro (portability, usability, great design) into a smaller, cheaper computer than doesn’t suffer performance issues as a result. Smaller than I expected at 245 mm x 175 mm x 8.3 mm x 522g (without type cover). A baby Surface. It uses the same mag-alloy chassis, has similar largish bezels, the characteristic stereo speakers etc. If you're buying devices for an all Microsoft company, the Microsoft Surface Go is a decent tablet option for staff members that want on-the-go portability, but don't need the robust processing power, larger size, or increased cost, of the Microsoft Surface Pro. At the end of the day, Surface Go is worth the money. If you’re looking for a solid first tablet or computer or introduction to Surface, then this model of the Surface Go is the way to go. It performs just as good as a Surface Pro, but with the limits and security of S Mode and the benefits of USB C. The design and build are both excellent, and inking is just so natural. The keyboard and type cover might be extra costs, and initially uncomfortable, but it adds up in the long run for multi-tasking and getting work done. Surface Go is well worth the money, and I hope that you think so too. The Surface Go is very close to an ideal budget tablet and mini laptop in one device, but short battery life holds it back. Microsoft Surface Go Wie klein ist das denn? 90% Microsoft Surface Go Ein großartiges Tablet – doch ist es zu teuer? Microsoft Surface Go Microsofts "Billig-Surface"